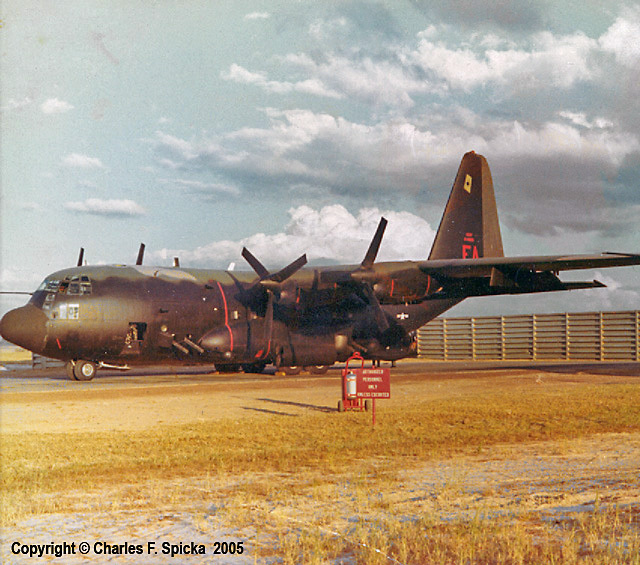 The AC-130 at Ubon Ratchathani, Thailand in the Spring of 1969. AC-130A #54-1629 is painted with a black underside and a camouflaged upper surface. This was the first paint scheme used on Spectre Gunships. This aircraft was the first AC-130A Gunship combat loss after a 37 mm hit, at night, on 24 May 1969. The hit came over the Trails in Laos and all but four crewmembers bailed out. The Spectre Gunship lost all hydraulic pressure due to enemy AAA. One Spectre crewmember was lost in flight over the target (SSgt. Jack W. Troglen, Illuminator Operator) and another (SSgt. Cecil Taylor, Flight Engineer) on landing when the right wing struck an F-4 barrier house and the aircraft caught fire. The 16th SOS lost 5 more AC-130s before the Vietnam War ended.